Rod Paige is a life-long educator and served as U.S. Secretary of Education from 2001 to 2005. As Secretary, Paige was an unstinting advocate of student achievement, employing “best of breed” solutions to achieve results towards the Department’s goal of raising national standards of educational excellence. 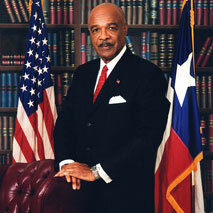 Paige earned his reputation for seeking out and implementing innovative approaches to systemic academic improvement when he served as Dean of the College of Education at Texas Southern University, where he established the University’s Center for Excellence in Urban Education. He has also shown a knack for inclusive leadership, first as a trustee and then as Superintendent of the Houston Independent School District, then the nation’s seventh largest district. In 2001, he was named National Superintendent of the Year by the American Association of School Administrators. Following his time in the Cabinet, Paige served as a Public Policy Fellow at the Woodrow Wilson International Center for Scholars. In 2006 he authored The War Against Hope and most recently in 2010 published The Black-White Achievement Gap: Why Closing it is the Greatest Civil Rights Issue of Our Time. In his quest to improve the quality of education for all students, he is an active member of several highly respected boards including the Thomas B. Fordham Foundation, The Broad Foundation, the American College of Education, the New England College of Finance and Business and the National Council of Economic Education’s Commission on the Skills of the American Workforce, among other organizations. Rod Paige resides in Houston, Texas with his wife Stephanie Nellons-Paige.